Negatively charged nitrogen vacancy (NV) color centers in diamond crystals have been intensively studied in the last few decades with the use of the optically detected magnetic resonance method which usually implies resonance excitation using a DC or pulsed drive field in the gigahertz range (MW field). 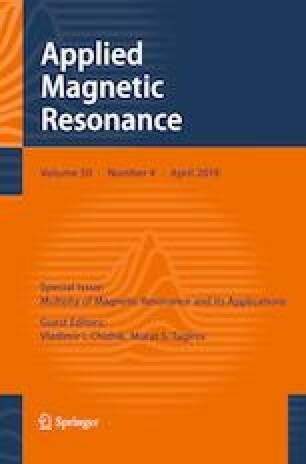 Various techniques for multi-frequency MW excitation of magnetic resonance in the nuclear structure of 14N atoms in NV centers were developed. Most of them use MW excitation in combination with RF modulation or direct RF excitation of nuclear transition. Here, we report on the possibility to detect ultra-narrow resonances in the nuclear structure of 14N using the ODMR methods with single-frequency DC RF excitation of the nuclear transition at 4.95 MHz. The resonances detected in a bulk sample in weak (0–10 mT) magnetic fields show approximately 7 kHz width HWHM, corresponding to T 2 * = 23 μs, and they seem to be insensitive to the magnetic field direction. These resonances may be of interest for solid-state quantum information processing, as well as for quantum magnetometry, especially in biological and medical applications where a strong MW drive field may be undesirable. We demonstrate that optical pumping can be used to create and detect not only the electron orientation, but also the nuclear one, even in the state with a zero electron spin projection. This allows sensitive non-pulsed detection methods like coherent population trapping to be applied to nuclear spins.